Click the button below to add the Akathist to Jesus, Light to Those in Darkness to your wish list. Eventually, everyone comes to dwell in darkness for a time. That is when we need to turn to Jesus, the only Light of the world and the only rescue for those in pain and despair. We break through the darkness by offering praise to God. This akathist is offered to all who sojourn in the darkness, with the prayer that they will use such praises as this to break through. Get the 3-Pack for only $12! 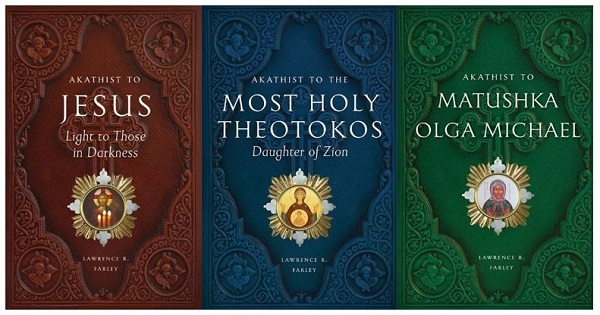 About the Author: Archpriest Lawrence R. Farley is the pastor of St. Herman of Alaska Orthodox Church (OCA) in Langley, B.C., Canada. He received his B.A. from Trinity College, Toronto, and his M.Div. from Wycliffe College, Toronto. A former Anglican priest, he converted to Orthodoxy in 1985 and studied for two years at St. Tikhon’s Orthodox Seminary in Pennsylvania. In addition to the Orthodox Bible Companion Series, he has also published A Song in the Furnace, The Empty Throne, Let Us Attend, One Flesh, The Christian Old Testament, Following Egeria, and more.